It’s been a pretty long time since I had an entire wave of DC Direct figures to review, but tonight I’m looking at the whole set of DC Direct Green Lantern Wave 5. Granted, I probably would have left one of these figures on the shelf if they hadn’t been cheaper as a set, but thanks to a good discount I'm reviewing all four figures from the wave tonight. DC Direct is notorious for not finishing what they start, but the Green Lantern Universe has obviously been a cash cow for them. Between the Green Lantern and Blackest Night lines, the DC Direct Green Lantern display has become a pretty crowded one! 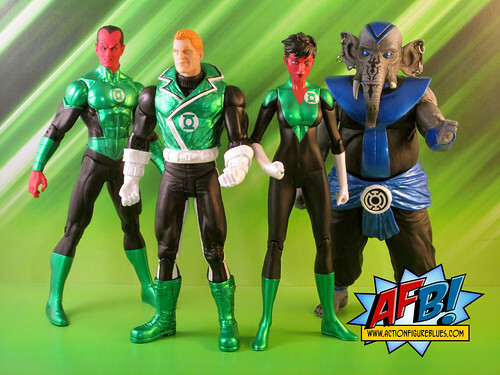 As well as being notable for being a fifth wave of a series, this wave also brings us two first time in plastic characters, Soranik Natu and Brother Warth. Both of these figures are great examples of what DCD has to offer when they bring their A game. Alongside these two new entrants, we have worthy revisits for Guy Gardner and Sinestro as a Green Lantern. Brother Warth is the obvious standout of this wave. This figure is a good reminder of why we need DCD to continue their action figure output - Mattel isn’t going to be bringing us the characters that need this amount of tooling. This is the kind of character that DCD generally excels in, and this figure is one of their best in a long time. 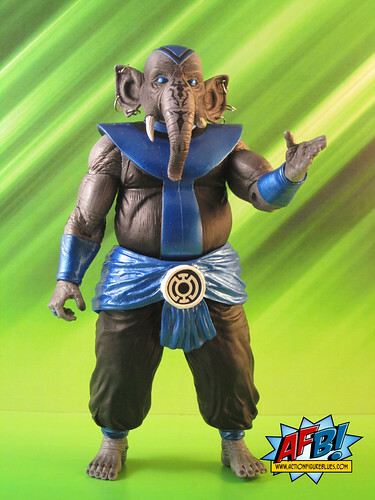 Beautiful sculpting work on this figure has created a great representation of our favourite elephantine Blue Lantern, and this has been bolstered by an excellent paint job using a clever mix of metallic and matte to represent different aspects of Warth's uniform and skin. It's early days to be thinking 6" figure of the year, but I'll be surprised if Warth doesn't factor somewhere in the runnings. 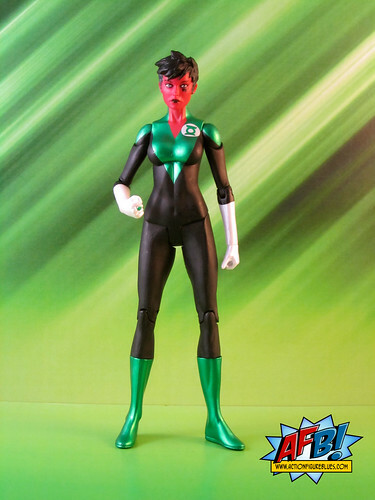 Soranik Natu has become a significant character in the GL-verse, and is therefore a welcome addition to the DCD line. 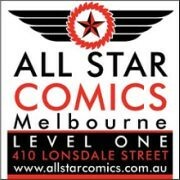 Unfortunately, DCD has used the Donna Troy base for her body, which is my least favourite of the different styles they recycle. The bizarrely flat hips are not my cup of tea. The headsculpt and uniform suit the character and are nicely painted, but once again DCD loses points from me by casting the figure in the character’s flesh tone rather than painting it - a cost cutting measure that sadly cheapens the look of the end result. Soranik is a great team builder for your GL shelf and a worthy purchase on that basis, but as an action figure she’s not much to write home about. Guy Gardner is a repeat character, but a welcome DCD revisit. 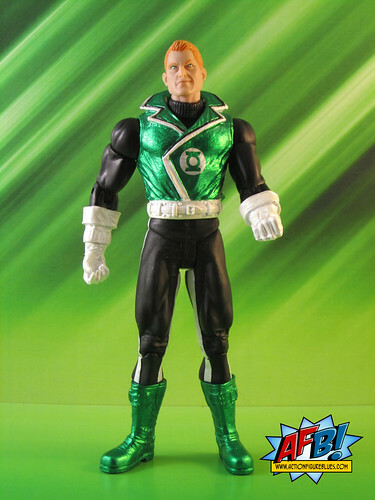 The original DCD Guy Gardner remains one of my favourite 6” action figures, but it is firmly rooted in the late ‘80s JLI Guy, so a modern update is certainly warranted. I like the headsculpt - modern look, same Guy attitude, but could have done with a bit less metallic on his tunic and boots. It doesn’t stop the figure from getting a thumbs up from me, but it does hurt my eyes a tad. 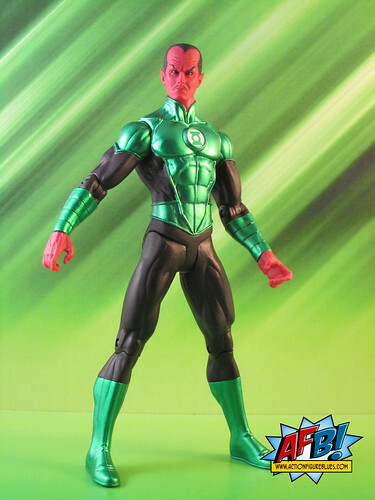 Sinestro as a Green Lantern has been done before, but once again we are getting a modern update and so it’s an allowable figure in my book. The figure wins points with me for having a much better iteration of Sinestro’s flesh tone as opposed to the grapeish purple DCD’s last few Sinny efforts have borne, but loses points for casting the figure out of the plastic of that colour instead of painting it. This figure also has a touch of the uber-metallics, but the headsculpt, body sculpt and stance is quite good. All up, this is quite a solid wave, helped greatly by the standout effort with Brother Warth. As we enter a time of uncertainty as to what we can expect from DCD, it’s good to be reminded of what they’re capable of! You can see more pics at Facebook, discuss this at the AFB Forum, and comment on this post to enter the AFB Comment of the Month Contest for February! I was actually quite surprised at how small Warth is. I thought he'd be an 8" figure. Really like the headsculpt on Sinestro. Nice one Andy. Not bad looking figures at all. Brother Warth for the win for me.